Lotte Reiniger is the foremost pioneer in the history of the animated film. She created her figures and designs by free-hand scissor cutting - an operation she performed with remarkable speed and dexterity. The depths and tones of the backgrounds were made using paper of varying thickness and transparency. Each frame is itself a unique work of art. The scenes were photographed on a horizontal table lit from below. 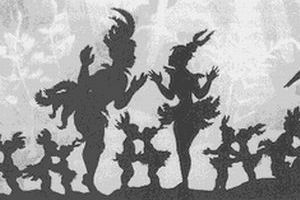 Since The Adventures of Prince Achmed Lotte Reiniger worked nearly continuously in her original field. Among the dozens of shorter films she made is the film which gained first prize at the Venice Film Festival, The Gallant Little Tailor. But perhaps her most popular film was the fantasy Papageno. Taking the character of the bird catcher and the music from Mozart's opera, The Magic Flute, Reiniger created one of her most famous films, displaying her immaculate sense of musical timing.